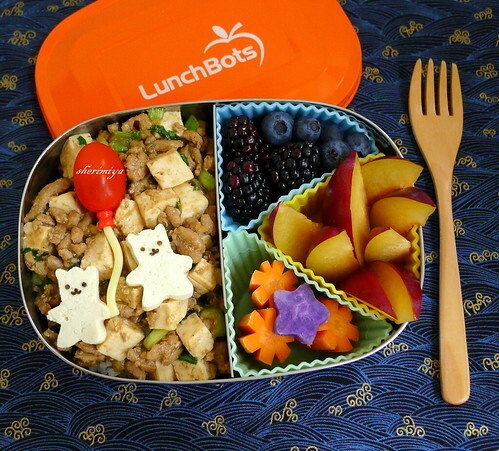 Mabo Tofu Bear LunchBots Bento, a photo by sherimiya ♥ on Flickr. Today the kids get ma bo tofu (see the basic recipe and method I use here), but I added in chopped baby bok choy just because I'm green like that. I sometimes add in pickled mustard greens too, just because I like the sour taste! But I omitted that this time. This batch includes scallions but excludes the spicy bean paste (TS won't abide it) and is layered over white/brown rice in my LunchBots Duo. The built-in divider keeps the mabo sauce separate from the rest of the goodies: black- and blueberries, a very-not-sweet plum, some carrots and a little Okinawan sweet potato star. 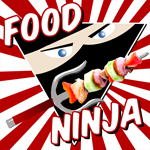 I reserved some tofu to cut out little bear shapes with nori faces, and gave them a grape tomato balloon to play with. Aww so cute! the fruit looks delicious, makes me very sad I didn't have time to pack my bento this morning! Yes, I love these flexible cups for just this reason. So practical. Glad it was useful to you too!